Mining adventures. Whenever I see a videogame attempt to send you on a journey, mining your way deep into the world as you go, then I can’t help but think of Minecraft or Terraria. For different reasons, they are the two champions of discovery. 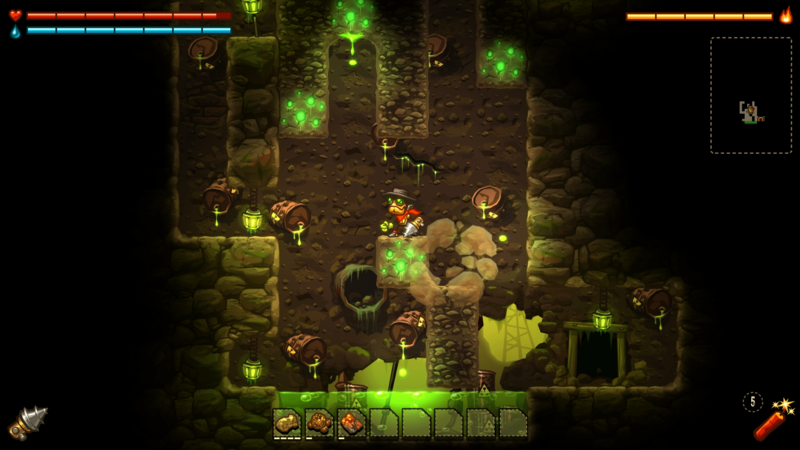 However, SteamWorld Dig is a mining adventure that, for sheer joy at least, bests both of those titles. It may not have the longevity of the world’s favourite discovery and crafting titles, but with the direction it brings, it’s a hell of a lot more fun. SteamWorld Dig casts you in the role of Rusty, a lone mining SteamBot who arrives in Tumbleton in search of his Uncle. Unfortunately it quickly transpires that Uncle Joe is no more, finally having succumbed to the way of the mines after many years of deep digging. However, the kind residents of Tumbleton urge Rusty to embark on a search of the mines in order to obtain his Uncle’s long lost loot…turning up all manner of surprises at the same time. Set as a 2D platformer, SteamWorld Dig is a bit of a slow burner. The first 30 minutes or so see you painfully smash your way through the dirt below the surface with only your trusty, but ultimately pretty useless pick axe to hand. It’s slow going, with Rusty taking far too long to battle his way through – and at times struggling to navigate the trickiest of pathways – picking up some pretty unremarkable and worthless gems along the way. But return to the surface a few times, upgrading your skills, axe and other equipment at the local stores and it doesn’t take too long before you find Rusty zipping his way around like a mole underground. Continue on your way discovering secret mines and exploring more of the deep underground world and you’ll begin to stumble upon many secrets, a huge amount of treasure and unfortunately, some rather devious underworld inhabitants. Again, your trusty axe is just about capable of dealing out a little damage to the strange creatures and ogres that frequent the underworld, but for the most part, you’ll be better off avoiding confrontation when you can. Earn enough to arm Rusty with a few sticks of TNT or a super powerful destructive punch however and you’ll soon start to take on all in front of you, even in their own dark and dingy back yard. With three rather distincts areas underground and the arrival of new improved equipment on a fairly regular basis, discovery never gets boring, one minute seeing you battle through some hardened rock, the next getting stuck in amongst re-emerging soil and then finally discovering the pièce de résistance. 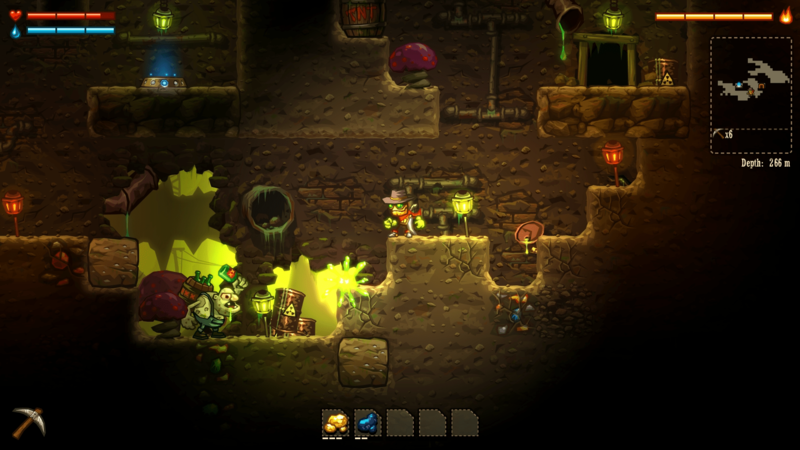 Leveling up your skills and equipment really is the order of the day with SteamWorld Dig. What initially seems like a bit of a grind, pretty quickly turns into a tactical battle against your own mind, with you needing to weigh up the pros and cons between delving a little deeper into the mines hoping that the dark clouds turn up gold, or heading back to the surface in order to trade the precious cargo you’ve already obtained. Thankfully, the residents of Tumbleton ensure that their stores are always well equipped for anything that may be needed. With light (or the distinct lack of it) playing a huge role in your underground travels, it’s pretty essential for you to ensure the sparsely scattered lamps are upgraded a whole load if you wish to continue searching. Similarly, unlock the steam powered drill and steam jump ability (it’s a world full of steam after all! ), and you’ll have to make sure you find the odd source of water so the drill continues to work its magic in destroying anything far quicker than your pick axe could ever dream of, and Rusty can finally manage to jump his way out of trouble. Much of the items available in the numerous stores can be bought for cash (an ever helpful Dorothy is more than happy to trade gems for moolah), however some will be locked down and available only to the most hardened of prospectors who manage to stumble upon magical orbs. The more you explore and the deeper you go underground, the more worthy the gems and orbs become and the more secrets you will uncover. I’m not going to go spoiling the story here and now, but by the time you get to the end of your time with SteamWorld Dig, you’ll have uncovered enough of the mines mysteries to shock even the most hardened of explorers. 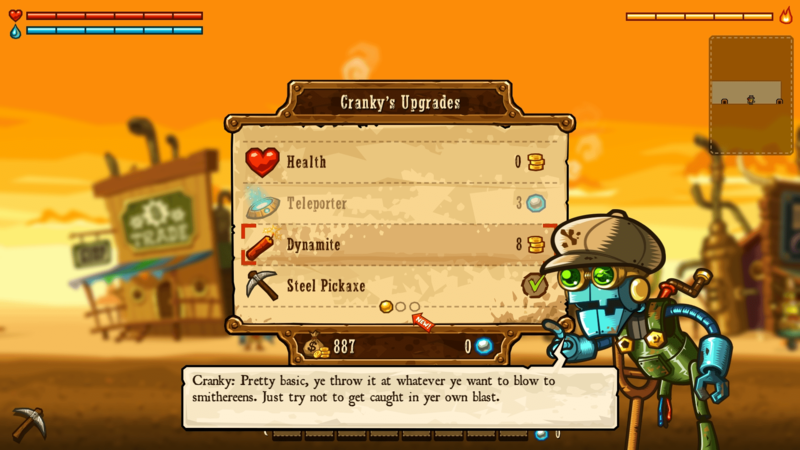 To complete the full tale, you’re going to be looking at anything up to five hours of work, although you should quite easily expect to see that time increase should you go about collecting every single orbs and treasure block available in SteamWorld Dig. An ever helpful map ensures that if you do so wish, you’ll be able to uncover near on everything pretty swiftly. Indeed, one of the achievements available will happily drop you gamerscore should you be able to rush through things in less than 2 hours 30 mins. Whilst this will be out of reach on your first playthrough, it’s a bit of a tempter for those cheevo hunters out there and those wishing to go digging a bit more. Image & Form Games have done a great job bringing SteamWorld Dig to Xbox One. Full of beautiful visuals, and stunning but humorous portrayals of the Wild West, you’ll find yourself digging through one of the most random but full-on addictive of games. In fact, it’s an absolute delight to play through and experience, with only the relatively short storyline and occasional early platforming issues stopping it from hitting full marks. If you’re looking for a quick tale that gives you the chance to go on a journey of discovery, then SteamWorld Dig fully delivers.